I had a little time to get out this afternoon after cleaning up my house so I decided to check up on the Nissitissit river in New Hampshire. 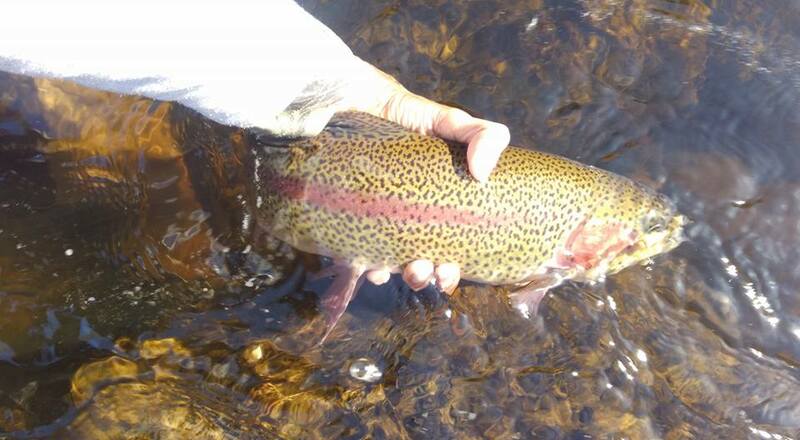 This section is stocked almost weekly from mid-April to late May with rainbow, brook, and brown trout. I haven't done too well there in the past (especially last year since it got very low) but since I didn't have too much time, I decided to try it anyways. The water was pretty high but fishable but somewhat warm. There was a new lay down in one of the roadside pools so I started off chucking streamers. Immediately, I got into a nice fallfish which popped off at my feet. I worked my way to the head of the run where I got a couple nice tugs and got another fallfish in full spawning dress. I figured it might be this kind of day since the water was warm but I continued to work my way upstream through some pocket water. In one such pocket, I pulled out a decent brookie, which got my spirits up. The rest of the pockets were chock full of chubs, shiners, and sunfish but they were fun to catch between trout. There were sulfurs coming off but nothing was rising. I should note that many of the fish came on the hare's ear soft hackle since it was a perfect imitation of the emerging mayfly nymphs. As I worked upstream however, the bites got less and less. Eventually, I worked my way up to a bridge to another stocking point and found a nice run. It was a little high for nymphing so I switched back to streamers. I got one really nice tug here but didn't manage to get it (darn reflexes!). Unfortunately, I got my streamer snagged in a tree so it ended that. I switched back to nymphing and worked my way upstream to a nice run where I got into another brookie and a brown.